Take Down works naturally to destroy odors at their source. Unlike many products that simply mask odors, Take Down uses safe, natural bacteria and enzymes to eliminate stubborn odors. Plus there are no harsh chemicals to worry about. The bacteria simply die when their job is done and convert to carbon dioxide and water. Take Down can be safely used in a variety of applications including restrooms, floors, carpet, garbage containers, cigarette urns, and anywhere foul odors are a problem. Take Down works great on carpets. Organic spots such as urine are quickly and easily destroyed. The unique bacteria and enzymes present go directly to the source to attach and eliminate malodors. Take Down is safe for use on synthetic carpets. 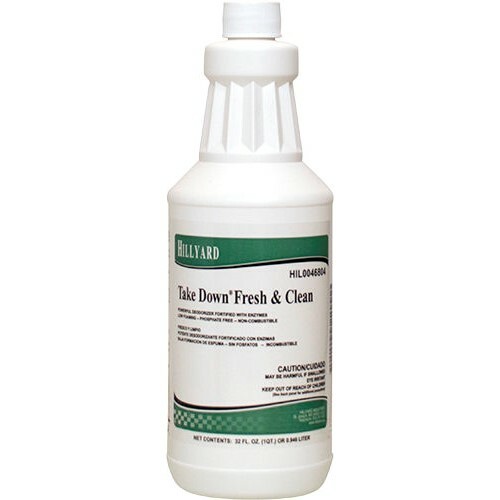 Take Down can also be used as an additive to cleaning solutions. Simply, add one to four ounces of Take Down per gallon of cleaning solution in a mop bucket, autoscrubber, or carpet extractor. This will provide residual odor protection for floors and carpets.